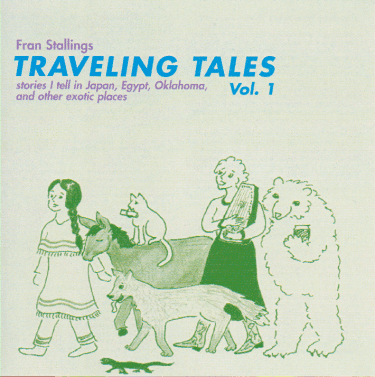 This CD contains Fran's tellings of stories which appeared in a bilingual book published for her fans in Japan. The CD is entirely in English. Recorded at KYFM, Bartlesville, OK, by Charlie Taraboletti, ©2005 Fran Stallings. 1. Sody Saleratus Your browser does not support the audio element. 2. Crowded House Your browser does not support the audio element. 3. Coyote and the Dogs Your browser does not support the audio element. 4. The Musicians of Bremen Your browser does not support the audio element. 5. Why Some Dogs Chase Cats Your browser does not support the audio element. 6. Shingebiss and the North Wind Your browser does not support the audio element. 8. The Tale of the Lizards' Tails Your browser does not support the audio element.